Hand to Hand project, July 13-18, done. 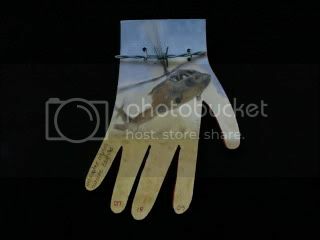 Here are the final images for the Hand to Hand project. I ended up sewing a little piece of barbed wire on each hand, using picture wire. In the back the wire is twisted together so each piece can be hung. July 14: Car bomb explodes outside Iraqi church, kills four. July 15: Suicide bomber shot dead while driving a car bomb in Fallujah. July 16: Shiite pilgrims wounded in bomb attack in Baghdad. July 17: Body of girl found in Kut. July 18: Helicopter crashes outside Baghdad. This morning I worked on my pro bono, non-profit Hand to Hand pieces, adding red acrylic painted edges. 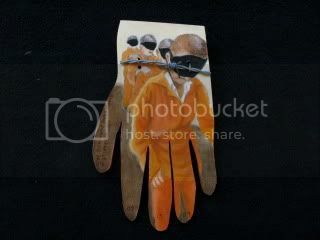 I am going to add a snippet of barbed wire to each one, so they will be my first mixed media pieces as well. Here’s a detail. I think it went pretty well. 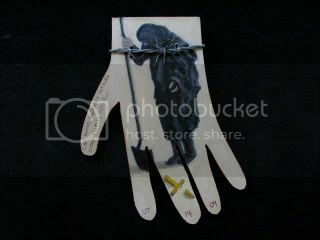 I finalized the six images I am doing for the Hand2Hand project. I’ve done my preliminary sketches, drawn them directly on the wooden cut-outs, and painted them. There’s a crashing helicopter, a shrouded corpse being lowered into a grave, a sniper in front of car with a shattered windshield, a pilgrim holding a dying child, a woman in a burkha holding a shovel by a shattered cross, and a woman sewing camo quilts for army cots. Each image corresponds to a specific story in the news this past week. Still have some background and detail work to do. Painting the child was painful. 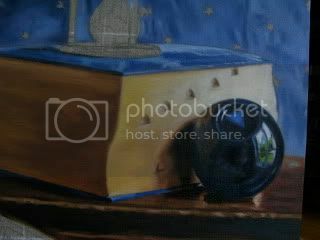 My life as a painter is blend of old tools and new technology, big projects and small experiments. I like that. •B&K hot is nearly complete. •I revisited the Tarot card painting and sharpened up some edges of card and reflections, plus another layer of color and texture on the rug. •Gridded a new linen canvas gessoed with clear gesso (!) for the Periodical Blues. •Picked up the photos of magnolias, hydrangeas and mimosas I shot this week. They look simple and fun to experiment with. I have to decide what size to make them and whether to paint them on canvas or board. I am thinking of them as little vacations from the big Metamorphosis project. 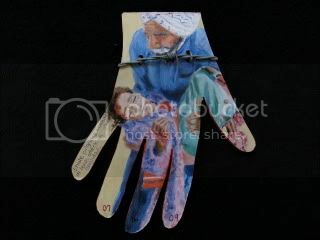 My task is to pick a news story about Iraq a day from any source (radio, online, newspapers) and create one glove or hand art in response for Monday July 13 through Saturday July 18. I’m to use my normal media (oil) and preferably come at the war issues from the angle of the imagery that I am already using in my art. 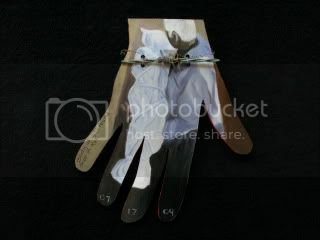 I’m supposed to date the gloves and can be literal or abstract with the headlines. Being me, my images with be representational and in oil on board. Robert cut six (plus two for back up) glove shapes out of wood for me. 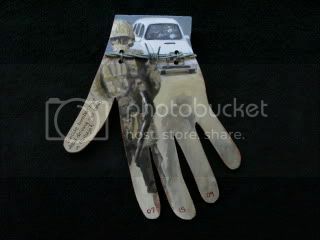 Somehow I will have to find a way to make the imagery I choose personal as well as about the war. 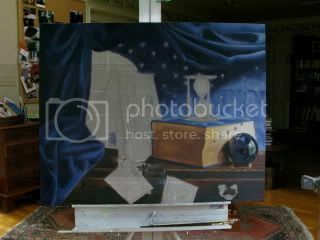 •Tomorrow I gesso the cut outs and work on the drawing of Blues.